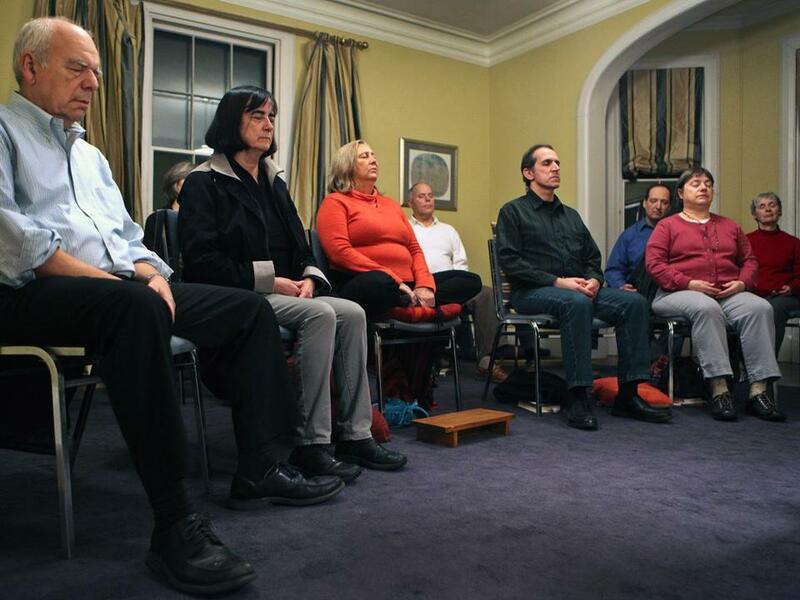 A class at the Advaita Meditation Center in Waltham. Correction: An earlier version of this story incorrectly stated where Herbert Benson began his mind-body research. On Halloween, turnout at the Advaita Meditation Center in Waltham was lower than usual, but still, nearly 30 people filled the rooms of the old Victorian mansion. They attended a variety of classes, from beginning to advanced meditation, or gathered informally at a drop-in session to repeat their mantras and corral their minds. Charnan Bray, an ESL teacher who lives in Waltham, is a newcomer. She considers herself an on-again off-again meditator who wants to become more serious about her practice. She went through a divorce last year and is looking for a way to become more mindful and reduce the stress in her life. Hannah Fairbairn of Belmont, a long-time member of the center, has been meditating for about 30 years. She turned to meditation shortly after she suffered a detached retina and began losing her eyesight. “I’m as sane as I am today not the least because of meditation,” she said. Since Herbert Benson, the cardiologist and author of the groundbreaking 1975 book “The Relaxation Response,” first began pioneering mind-body research 40 years ago, numerous scientific studies have offered evidence for both Bray’s hopes and Fairbairn’s experience. Researchers at universities across the world have reported positive results from meditation in a wide range of ailments, including high blood pressure, stroke risk, heart disease, weight management, chronic pain, and mental health. The 2007 National Health Interview Survey found that 20 million US adults had turned to meditation for health reasons in the previous year. In addition to medical centers that offer meditation, programs can be found throughout the state. This consumer interest, along with the potential public health impact of meditation, has helped spur research into its effectiveness. Since 2002, the government’s National Center for Complementary and Alternative Medicine has funded about $57.7 million in scientific research into meditation, according to statistics provided by the office. Last April, the International Symposia for Contemplative Studies, a first-ever conference of researchers, scholars, and students in the field, drew 720 participants from all over the world. Why such scientific interest in meditation? Early research focused on the health benefits of stress reduction from meditation, but in recent years, neuroscientists like Lazar have begun using magnetic resonance imaging to show that meditation can make actual structural changes in the brain. In a new imaging study released this fall, a team of researchers from Mass. Generall, Boston University, and Emory University, among others, reported that an eight-week meditation course can have measurable and enduring effects on how the brain functions, even when someone is not actively meditating. To address criticism that people with thickened gray matter in those areas might simply be attracted to meditation, researchers conducted a follow-up study. They scanned the brains of 16 people new to meditation before and after an eight-week program in which they meditated an average of 30 minutes per day. These were compared with brain scans of a control group of 17 people. Researchers found that the meditators had significant density changes in the hippocampus and other brain structures related to learning, memory, self-awareness, and empathy. Another change that was noted in the meditating group was a decrease in the density of gray matter in the amygdala, which is correlated with a decline in stress, Lazar said. At the UCLA Laboratory of Neuro Imaging in California, researchers released a study in March suggesting that meditation didn’t just thicken gray matter, but also increased the number of folds in the cortex — called gyrification. The folding of the cortex, the outermost layer of neural tissue, is believed to play a role in memory, attention, thought, and consciousness. The bumps and grooves of the folds increase the brain’s surface layer and may affect the amount of information that can be processed. The UCLA research team, led by neuroscientist Eileen Luders, scanned the brains of 23 longtime meditators and found the cortex had larger amounts of gyrification than 16 control subjects, and that the increased volume of cortical folding correlated with the number of years a subject had meditated. The potential benefits of increased cortical gyrification is still theoretical and more research is needed, Luders said by e-mail. In a new imaging study published Nov. 1 in the online journal Frontiers in Human Neuroscience, researchers at Mass. General found evidence that meditation may cause changes in the way the amygdala fires up in response to emotional stimuli, according to lead author Gaëlle Desbordes, a neuroscience research fellow at both Mass. General and Boston University. The study compared three groups, each with 12 participants. One group practiced compassion-based meditation; the second practiced mindful-attention meditation; and the third, a control group, took part in health discussion sessions. The compassion training included basic meditation techniques also used by the mindful-meditation group, but also asked participants to focus on compassion for themselves, family, and people they did not know. Study participants were shown positive, negative, and neutral images while their brains were scanned three weeks before and three weeks after the eight-week program. Researchers found that after the eight-week program, those in the compassion-based meditation group had an increased brain response to images of others’ suffering, but that the increased responsiveness did not create more stress. The sensitivity to others’ suffering also correlated with a decrease in a participant’s depression, Desbordes said. Back at the Advaita Meditation Center, Fairbairn recalls that when she first began to meditate 30 years ago, the practice was considered somewhat fringe. “If you mentioned meditation to people back then, they looked at you funny,” she said. Today, you can find meditation groups at spiritual centers like Advaita, but also at colleges, social meet-ups, yoga centers, and medical clinics.